Starting a new year means we have an opportunity to start our savings plan all over again. I like you sometimes struggle, because life gets a little busier and less easy to manage. This makes it hard to be able to nab all the deals I need. That being said the topic last night was how can we save more money? 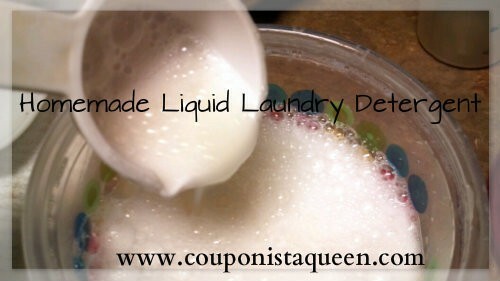 A lot of the fans showed interest in DIY laundry soap. I had researched this in the past and found a recipe that seems to work for a very frugally minded family, the Duggars. I found this on the Duggar’s website and I’m sharing with you now. I will attempt to make this myself tomorrow and will post a follow up with pictures of my success or failure. I will tell you right now that I easily found all the ingredients at my local Walmart and I am adding a bar of the pink ZOTE bar for an added kick which I have bought at the 99 cent store. My husband has donated his trusty bucket (he doesn’t know it yet) and I have lavender essential oil already so I am adding that for fragrance, maybe. This is new territory for me and I invite you to join me and post any suggestions you may have. – Grate the bar of soap and add to saucepan with water. Stir continually over medium-low heat until soap dissolves and is melted. Thank you to the Duggars for sharing this useful information. I will post pictures tomorrow as this is my task for Tuesday! I’ve heard of this before. My wife wanted to make her own laundry soap. I convinced her not to. I was always really skeptical on how well it works. I am interested in hearing how well it cleans the clothes. I will check back tomorrow. It did a great job! Will post the results in Part III either tonight or tomorrow! Is it for he washers?